Michael Hirsh highlights Janet Yellen as an “old school progressive economist” in a recent piece in the National Journal. Her personal agenda supposedly includes serious concern with increasing employment and regulatory control of Wall Street. But whether she can indulge these “personal passions” in the face of the extraordinary strategic situation of the current Fed is another question. There is, for example, the taper – with apologies to my early English teachers who would admonish me there is a “i” rather than “e” at the end of that word. After testing the waters mid-year 2013 and then pulling back, when initial reaction seemed over-the-top, the Federal Reserve announced onset of a program to “taper” bond purchases December 2013. So far, there have been two reductions by $10 billion a month, leaving bond purchases running $65 billion a month. This relatively modest pace, however, has been fingered as a prime cause of precipitous currency impacts by problem emerging countries (India, for example). 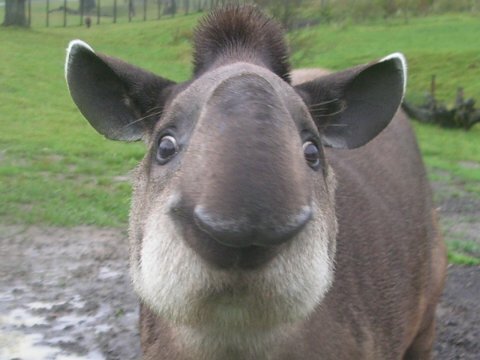 But taper (or tapir) not-withstanding, the real rhino in the room is the Fed balance sheet with its sort of crystalized excess reserve balances of US banks. Currently US banks hold about $2.5 trillion in excess reserves. 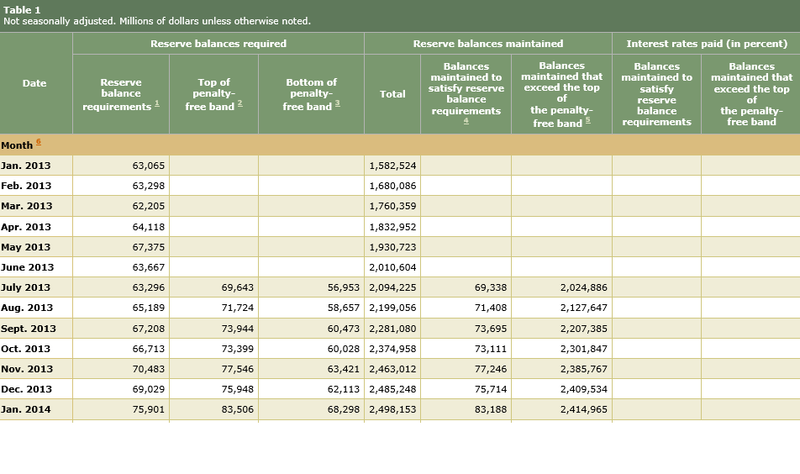 Here’s a Treasury Department table which shows how these excess reserves continue to skyrocket, and the level of reserves required by Fed authorities as security for the level of bank deposits. So excess reserves held in the Fed have surged by $1 trillion over the last year, and required reserves are more than an order of magnitude less than these excess reserves. The flip side of these excess reserves is expansion in the US monetary base. 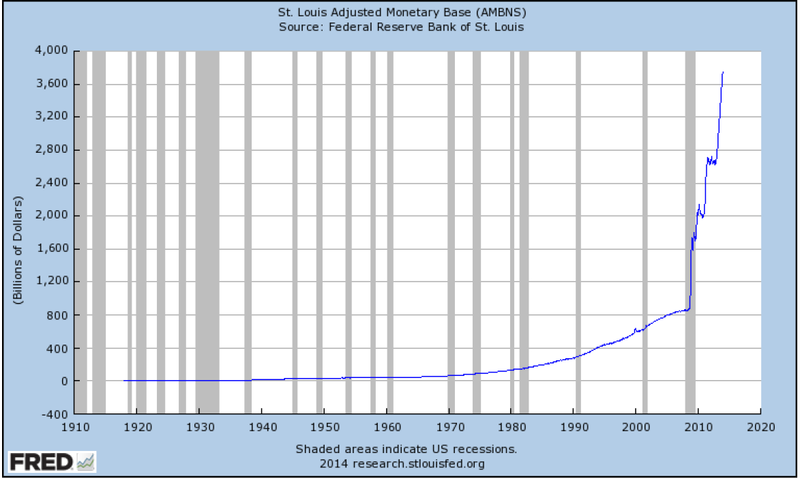 The monetary base series above shows total bank reserves and the currency stock, plus adjustments. This is what Milton Friedman often called “high powered money,” since it is available immediately for bank loans. But there have been few loans, and that is one important point. We’ve repeatedly pointed out that the Federal Reserve has been intentionally discouraged banks from lending to Main Street – in a misguided attempt to curb inflation – which has increased unemployment and stalled out the economy. Ritholz backs this claim with careful research into and citation of Fed documents and other pertinent materials. Bottom line – there is strong evidence the new Fed policy of paying interest on bank reserves is a deliberate attempt to create a firewall between the impacts of quantitative easing and inflation. The only problem is that all this new money that has been created misses Main Street, for the most part, but fuels financial speculation here and abroad. Admittedly, though, the Federal Reserve has done a lot of heavy lifting since the financial crises in 2008. Created in 1913, the Federal Reserve Bank is a “bank of banks,” whose primary depositors are commercial banks. The Fed is charged with maintaining stable prices and employment, objectives not always in synch with each other. Under the previous Chairman, Ben Bernacke, the Fed led the way into new policy responses to problems such as potential global financial collapse and high, persisting levels of unemployment. Other innovations followed, such as payment of interest by the Fed on reserve deposits of commercial banks, as well as large purchases of mortgage securities, bolstering the housing market and tamping down long term interest rates. The Fed has done this in a political context generally unfavorable to the type of fiscal stimulus which might be expected, given the severity of the unemployment problems. The new Chair, Janet Yellen, for example, has noted that cutbacks at the state level following on the recession of 2008-2009 might well have been the occasion for more ambitious federal economic stimulus. This, however, was blocked by Congress. As a result, the Fed has borne a disproportionate share of the burden of rebuilding the balance sheets of US banks, stabilizing housing markets, and pushing forward at least some type of economic recovery. This is not to lionize the Fed, since many criticisms can be made. 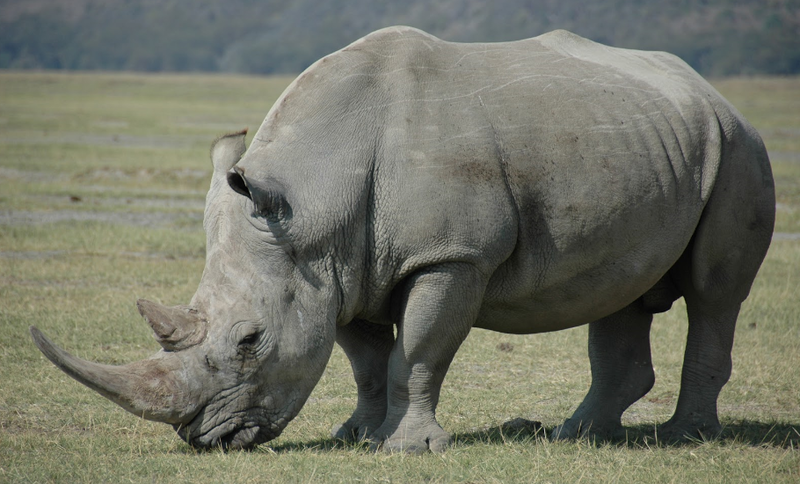 In terms of forecasting, however, the focus must be on the rhino in the room growing bigger all the time. Can it be led peaceably outside to pasture, for a major weight reduction to something like a pony, again? With apologies for mixed metaphors, the following chart highlights the issue. This shows the total of the “monetary base” dating from the beginning of 2006. 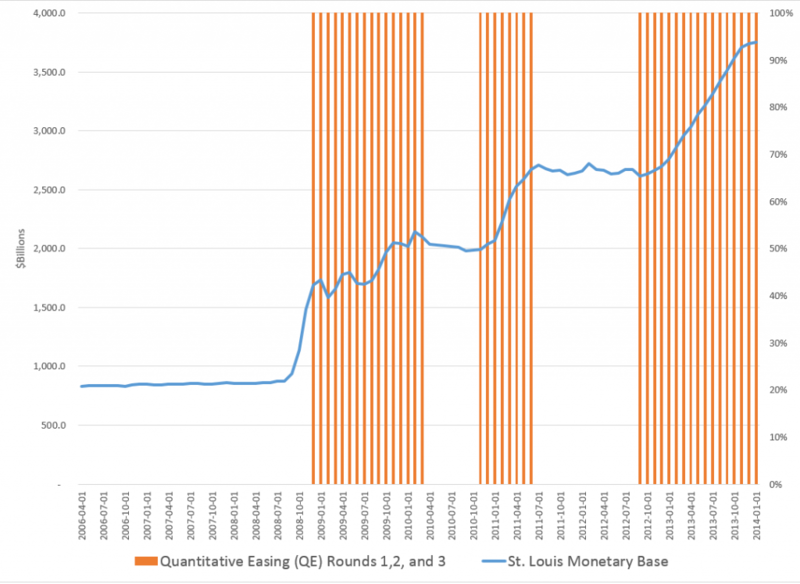 The red shaded areas of the graph indicate the time windows in which the various “Quantitative Easing” (QE) policies have been in effect – now three QE’s, QE1, QE2, and QE3. Another problem concerns the composition of the Fed holdings which balance off against these reserves. The Fed has invested and is investing heavily in mortgage-backed securities, and has other sorts of non-traditional assets in its portfolio. In fact, given the lack-luster growth and employment in the US economy since 2008, the Fed has been one of the primary forces supporting “recovery” and climbing prices in the housing market. So there are really two problems. First, the taper. Then, the “winding down” of Fed positions in these assets. Chairperson Yellen has her hands full – and this is not even to mention the potential hair-rending that would unfold, were another recession to start later this year or in 2015 – perhaps due to political wars over the US debt limit, upheavals in emerging markets, or further self-defeating moves by the “leadership” of the EU.